Looks yummy. I just posted a piece on Lecso – a classic Hungarian Pepper Stew with Hungarian Sausage. Looks similar. Wondered if you would like to try it out. Also – I am supposed to let you know some-how that I am a new WORDPRESS blogger. But I have posted on BLOGSPOT for years and have recipes posted on my own website. We do sausage and pepper sandwiches in our crockpot! 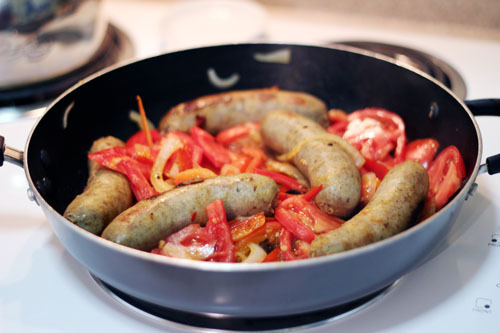 Sausage, peppers, onions, and garlic, with crushed tomatoes, wine or balsamic vinegar, and a little oregano and chile flakes… Such a nice dinner to come home to after a long day, and especially great for a busy evening, since we just have to throw it all on a toasted roll. But no, it’s not necessary to brown the sausages first! You certainly could, but I find that it works just dandy without the extra step. I do mine on Low for 8 hours. The sausages get so tender, they almost fall apart, which adds a whole different dimension to the sandwich from what you typically expect. Whoops! And yes, 28 oz. crushed tomatoes! the important thing is that, in addition to the tomatoes, you have enough liquid (I usually have to add both wine and a touch of stock or water) to cover the sausage and veggies, or it’ll reduce too much. I suggest about a 1/2 cup of wine in with the tomatoes, and then the rest as water or stock…and if you’re using vinegar instead, then 1/4 cup vinegar and the rest water or stock. Thanks – I’m going to try it this week sometime! This sounds really delicious right now! I may change my plans and throw this into the dinner mix this weekend. I believe you when you say the cooked tomatoes put it over the edge – yum! Yum! I love sausage and peppers! This would be good on buttered toasted roll rubbed with garlic. I love simple meals that have such wonderful flavours – yummy. I’m going to make these with some roasted grape tomatoes and peppers from last year’s garden that I have in my freezer. You can’t beat roasted tomatoes — they are so sweet and good — perfect to go with the sausage and onions. Now I just need some good rolls. Thanks for the inspiration!